Scrappy is carried over as the case of the week this week because she serves as an example of how "it's never over till it's over". Scrappy Ramono is an interesting case that reminds us of why we are such big fans of spaying and neutering animals early in life. It might be argued that it is simply the "surgeons philosophy" to "when in doubt, cut it out". However, we seldom have the opportunity prevent cancer that often kills by doing a procedure that makes a pet easier to care for throughout their life. 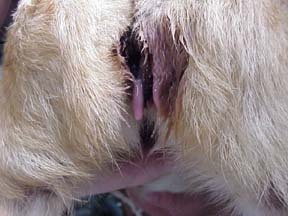 We know that when female dogs undergo ovariohysterectomy before their first "heat cycle" there is very close to zero chance that they will develop mammary cancer later in life. When they go through "heat cycles" for two years there is very close to a 100% rate of mammary cancer in females that live to be 15 years old. Nearly half of these cancers will be malignant in nature. Scrappy first came to us during the winter of 1999 with two small lumps in the mammary chain. She also had an abscessed tooth so it made sense to remove the tumor, extract the abscessed tooth and clean up the other teeth which we did. In the past we would normally have pushed to "spay" Scrappy at the same time but some of the "experts" have recently reported that "spaying" AFTER the occurrence of the cancer does not prolong life. Since Scrappy is an older dog we elected to limit the time of the anesthesia. In early May Scrappy was presented to us again with "regrowth" of the tumor. However, it turned out the this was a new tumor that had occurred on the OTHER mammary chain. Scrappy was scheduled for surgery in late May. However, on May 24 Scrappy's owner reported that Scrappy had been very depressed for a few days and had been drinking a lot of water. Scrappy was indeed quite depressed and had a fair amount of abdominal pain. She was about 10-12 % dehydrated. 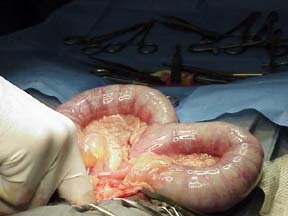 Her kidney function tests indicated a reduction in removal of wastes from the body (BUN - 86). Some of her electrolytes were lower than normal (sodium and chloride). After admission it was seen that she was vomiting regularly and some jaundice was observed. Though she was not running a fever it was clear from her blood smear that some sort of a severe inflammatory process was going on. The numbers of the white blood cells that are usually involved with fighting infection were dramatically elevated and there was a shift in the nature of those cells that indicated active intensive production of new cells to replace the ones being used. 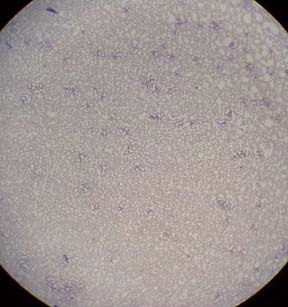 This type of dramatic usage of neutrophiles occurs most frequently with bacterial infection of hollow body organs such as peritonitis, pleuritis and pyometria (infection of the uterus). 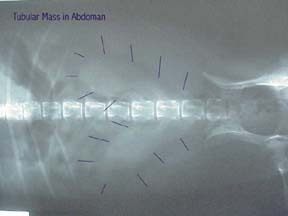 Radiographs indicated a soft tissue, tubular swelling displacing the other abdominal contents dorsally and cranially. 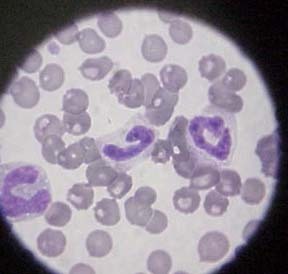 The location indicated an enlarged uterus and the combination of the inflammatory neutrophilia and the radiographs resulted in a presumptive diagnosis of a closed pyometria. Fluid therapy was started as well as antibiotics. However, for most cases of pyometria surgery is needed to remove the infection. 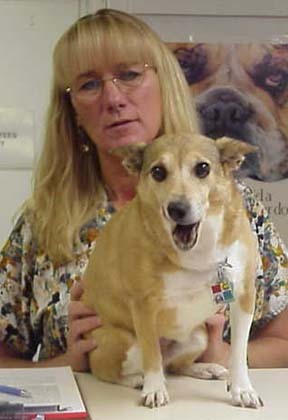 However, in most cases the patient is quite ill, in most cases an older animal and in many cases, as in Scrappy's case, other organ systems are affected making the surgery somewhat risky. After fluid therapy was begun a vaginal discharge began that confirmed out presumptive diagnosis. 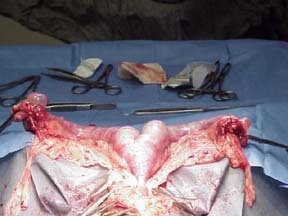 Even with the infected uterus is is usually advisable to remove the uterus at surgery. In some cases attempts are made to cause the uterus to drain using hormonal therapy. However, this is only done when the primary function of the pet is as a breeding animal. Surgery was conducted and the greatly distended uterus was removed. Handling the fragile uterus requires care not to unduly expose the abdomen to the bacteria in the uterus. Some problems with maintaining blood pressure were encountered during the surgery but she did respond to active fluid therapy with lactated ringers solution, hetastarch (a type of fluid that helps maintain osmotic pressure) and glucose. Intravenous antibiotics were used before, during and after the surgery. Scrappy was doing well when I typed the original text but it was a very long path since then. I finally sent Scrappy home on 6-4 and I would say that she is not totally out of the woods yet. I'll leave the original text as it was but tell you a little about "the rest of the story" first. Scrappy continued to remain depressed and anorexic for several days after the surgery. A couple of days is normal after a pyometria but then things should turn around. 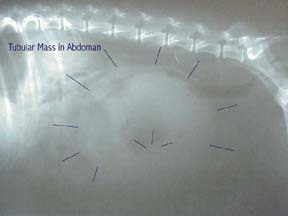 In Scrappy's case there must have been a significant amount of toxicity to the liver (as indicated by chemistry profiling) and nausea remained a major problem for several days. We were able to get Scrappy to hold down an enriched diet starting on about day 3 however he never ate voluntarily for us the entire time he was in the hospital. Starting on 6-2-99 we started sending Scrappy home with the owner for the day and they had some success getting her to eat at home. We continued aggressive force feeding to make sure that Scrappy had adequate levels of nutrition for recovery since vomiting had stopped. As of 6-5 Scrappy was eating well at home on her own. This case serves as an example of the general rule of not celebrating too early. It is also important even at this point to remember that even now we have a lot of concerns. This is a geriatric animal that has had two prolonged anesthetics and surgeries in the last 6 months. The severe depression following this second surgery has been bound to take a toll on Scrappy's kidney, heart and liver. It probably underlines the importance that the case was presented for originally . . . that basic preventative health care (in this case spaying early and good dental care) can make geriatric life much less eventful. It's hard to see this in that 6 month old puppy but it is probably our most important task as veterinarians and technicians to explain the advantages of acting early in life to prevent stories like Scrappy's. It also illustrates that sometimes the owner can do things that we can't do, in this case bring Scrappy around the corner to recovery with TLC. Now, as a final chapter to the "Scrappy" case was another lesson, in this case for me. About 2 months after the last notation Scrappy's owner pointed out NEW lumps in Scrappy's mammary chain. My heart was in my throat as soon as I saw that. When we have removed one known "cancerous" lump from the mammary chain and had a recurrence in the same area, removed the lumps and had ANOTHER recurrence my assumption has always been for the worst. Mr. Romano wanted my advice on where to go from here. I'm afraid that my recommendation would have to be to operate again. I told him I would consult with an oncologist but that I would probably recommend another surgery despite hating to have to do so. I must admit that I was just going through the motions to contact the cancer expert. I put in a call to Dr. Carolyn Henry at the University of Missouri, my alma mater. She asked what the result of the biopsy of the second tumor excision. I had to admit that I had not sent that tumor for histopathology. I had assumed that it was a recurrence. The pathologists credo is "if it's worth cutting off it's worth sending in". I had violated this but at least we do have a policy of always saving the tumors in formalin and saving them if it necessary to submit them later. This we went ahead and did. The result of the histopathology report was that the lumps were benign proliferations of tissue which were probably stimulated by the same hormonal influence that "caused" the pyometria. If I had put Scrappy through the third surgery I probably would have declined to send off the tissue for histopathology again with the same assumption as with the second surgery. This would have been a great stress for Scrappy that might have pushed him "over the edge". Scrappy looks pretty good as she boards at Four Paws on 9-28. She seems to be doing quite well without the additional surgery!